The U.S. job market keeps weakening. According to the latest unemployment report released by the Labor Department this morning, U.S. employers slashed 651,000 nonfarm positions in February 2009, pushing the monthly unemployment rate to 8.1%, the highest level since December 1983. February marks the third straight month that job losses exceeded 600,000, the first time that happened since 1939. 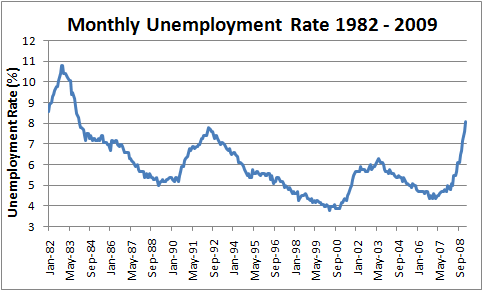 The monthly job losses of 651K are also the largest since 1949. Household survey data showed that the total number of unemployed person increased by 851,000 last month to 12.5 million. In February, the professional and business service sector suffered the most job losses of 180,000, while employment in manufacturing and construction industry dropped 168,000 and 104,000, respectively. The financial sector, the source of this recession, saw employment declined by 44,000. The only sector that has created new jobs last month is heath care, where a total of 27,000 new jobs were added. Since the recession began in December 2007, more than 4.4 million workers lost their jobs, with more than half of the job losses occurred in the past four months. Hi…those that have been layed off need to unite. Share ideas. Give tips and tricks. I don’t think this is going to get better soon. I’ve been looking for jobs online and in the paper, and it’s looking bad. The best site I’ve found is http://www.Hound.com . It’s a really good site, and it has jobs from employer websites, not recruiters. Good luck job hunting!